Do you have any rituals or routines that you use to get in the zone? I’m getting more and more fascinated by the idea of rituals to help improve my focus and performance. or Verne Harnish’s suggested daily, weekly, monthly, quarterly and annual meetings that become rituals over time. I actively choose not to have superstitions because I believe I’m ultimately responsible for my own performance so I don’t want to blame a bad result on losing my lucky watch. One thing I do though, is I’ve painted 3 words on the bottom of the boat at my feet where I can see them: Who, When, Gold. I use the words as prompts. Who – If not me, who? A reminder to choose myself. When – If not now, when? The time is now so go for it. Gold – That’s my goal. What a way to get into your race mindset! I was inspired at the time and have often revisited this advice for inspiration. Tonnes of people I admire talk about the importance of rituals – Josh Waitzkin (The Art of Learning), Jim Loehr (The Only Way To Win), Tim Ferriss (The 4 Hour Work Week), Leo Babauta (The Power of Less)… to name a few. So I’ve been experimenting with my morning ritual for quite a while, and it’s evolved over time. I’m sure it will change again but at the moment it’s working well to help me prioritise, get focussed and stay focussed for the day. Here’s mine – tweak it to suit you if you’re interested in giving it a go. I take a breather when my baby girl wakes up for breakfast/shower/help out time. 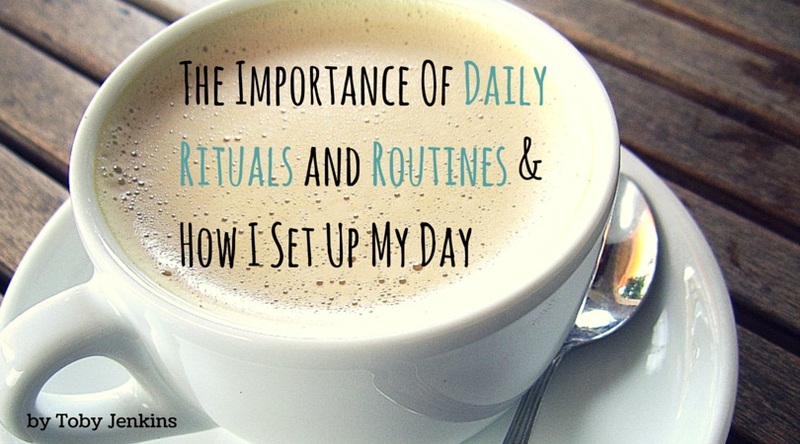 Do you have rituals or routines that you use to set up your day or stayed focused throughout?